Green means below replacement. Red means above and yellow is marginal. I would have reversed that, of course. Red usually means a problem and green is reassuring. The article goes on to say that, quite reasonably, two thirds of countries in more developed regions have policies for increasing the number of babies. This is applauded as being almost successful in Sweden and France, but dismally unsuccessful in Germany at births per woman of 1.4 (You do remember the Third Reich. The policy was really to mix all Germans into a super race. The might recover some day, but they certainly haven’t yet.) 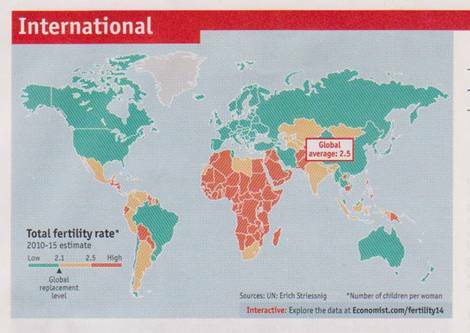 And the US is not so far below replacement in spite of any policy to encourage having babies. Really. They think long term 1.5 would be dandy. There is no breath to the effect of, “Of course we must fix this one day.” No, eternal decline – provided that everybody is educated – is not only ideal but possible. Of course it is not. And of course it is the educated who have the broad and hence lethal social pool. They’re going to croak first. At least the ECONOMIST is keeping this all in mind. And most developed countries are working at it, however ineffectively. Oh for a muse of fire! Could I but get them to listen. Not today but who knows? And there might just be enough time left to fix it, although I am getting more and more doubtful of that.